Ray Allen came up big in the clutch for the Celtics and vindicated himself after the 1 for 12 shooting night he had on Saturday in game 1, while the Spurs jumped early on the Mavs again but didn’t lose their grip on the game this time. The talk around the media in the past couple of days after the game 1 105-103 win by the Bulls is that Boston isn’t quick enough to handle Chicago, and that they can’t win without Garnett. Boston quick enough on defense once again by they delivered on offense, especially Ray Allen. Allen scored a 3 pointer that gave Boston a 115-113 lead before Ben Gordon tied things up at 115 with 12 seconds to go. Allen got the winning shot seconds later, and rushed to hug the injured Garnett on the bench, giving Boston a much needed confidence booster en route to Chicago. 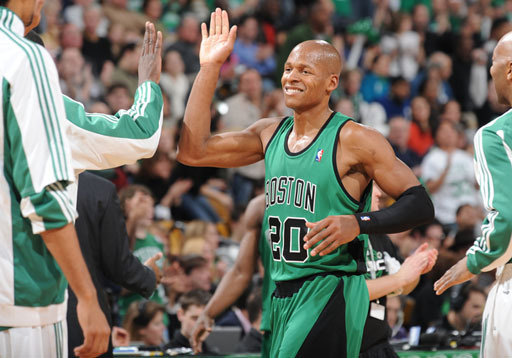 Ray Allen had 30 points with 6 three pointers to lead the Celtics scorers, and had a lot of help from Glen Davis (26 points, 9 rebounds) and the current best player for the Celtics, Rajon Rondo. Rondo Triple Doubled with 19 points, 16 assists, 12 rebounds and 5 steals in a huge game for him. On the visitors side it was Ben Gordon with a playoff career record of 42 points with 6 from three point land but not much else, with Derrick Rose falling from the heights of game 1 to only 10 points and Ty Thomas was limited to only 6. The Spurs didn’t let this one get away, and after jumping to a 30-19 lead in the first quarter didn’t let the Mavericks get closer than 9, and finished them off in the third quarter with an 11-0 run that put the lead around 20 for the rest of the game. Tony Parker came up big for the Spurs with 38 points, 27 of them in the first half and added 8 assists and was aggressive all night in penetrating to the basket. The Mavs couldn’t handle Parker and couldn’t control the paint, losing the rebound battle 28-44. Maybe they were happy with one win in San Antonio and saved some energy for the home stand. Jason Terry led the Mavs with 16, Jason Kidd added 14 but with Nowitzki scoring only 14 and Josh Howard limited to 7, the Mavs couldn’t dream of winning.